Little attention was paid when “The One” selected Valerie Jarrett as his chief adviser. Heck, the main chatter, regarding her appointment, revolved around the inclusiveness of the POTUS, as he deigned to choose a woman to be his joined-at-the-hip-mate – politically speaking. What a guy…a thoroughly modern first dude…unafraid to check his manhood at the door. You can’t make this crap up. Never mind. Political sleighs of hand are often nothing more than smoke and mirrors. In fact, they are specifically designed to prop up the contrived media narrative. Therefore, the authentic ties that bind, the Radical-in-Chief to his Numero Uno political helpmate, demand the utmost scrutiny. Better late than never. Having reported on their nexus through ‘Valerie Jarrett’s Communist Leanings & Why She Matters…’ – https://adinakutnicki.com/2012/08/17/valerie-jarretts-communist-leanings-why-she-matters-serving-as-barack-hussein-obamas-alter-ego-cementing-the-redgreen-alliance-commentary-by-adina-kutnicki/ – it was patently clear that her background, and her closer than close relationship with the POTUS, was/is deeply relevant. As such, the following article sharpens the focus, even more glaringly. ‘1979 ARTICLE TIES ‘OBAMA’S REAL FATHER’ TO SAUDI FINANCIER? “The recently discovered 1979 newspaper article by Vernon Jarrett – the father-in-law of senior White House adviser Valerie Jarrett, opens a new dimension to understanding Obama’s youth, as Vernon Jarrett was a close friend of Obama’s Communist Party-activist mentor, Frank Marshall Davis. The Nov. 6, 1979, column by Vernon Jarrett in the St. Petersburg Independent was unearthed by Frank Miele, editor of the Daily Inter Lake in Kalispell, Mont. 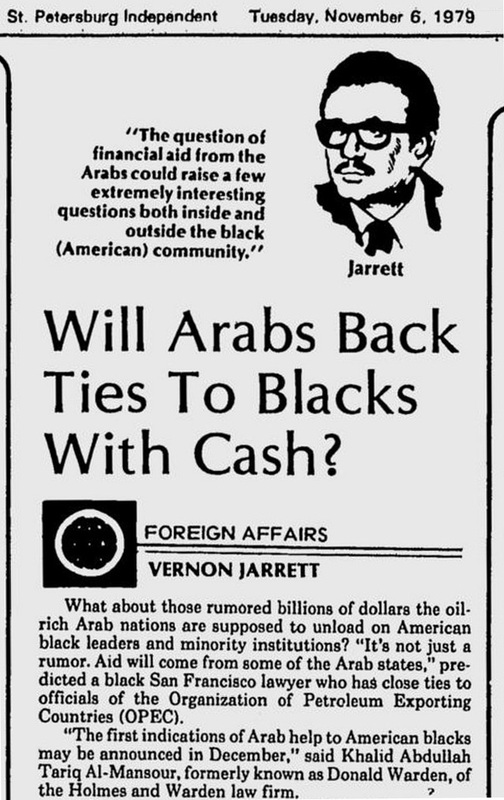 In the column, which originally appeared in the Chicago Tribune Nov. 2, 1979, Jarrett reported a proposal by Islamic radical and former Black Panther Khalid Abdullah Tariq al-Monsour, the lawyer previously known as Donald Warden, to work on behalf of Saudi Arabia and OPEC to provide $20 million for 10 years to aid 10,000 minority students each year. Davis and Vernon Jarrett were close friends in Chicago and colleagues at the Chicago Defender and the Chicago Star, two communist-run newspapers in the 1940s. In early 1948, Davis and Jarrett served together on the publicity committee of the Citizen’s Committee to Aid Packing-House Workers, a communist-organized labor union that represented workers in the meatpacking industry. “Very possibly Vernon Jarrett’s path crossed that of Frank Marshall Davis when Barack Obama, Frank Marshall Davis’ son, needed financing to attend Harvard,” Gilbert said. Gilbert carried the relationships full circle. As a former colleague of Davis in Chicago, he said, Jarrett had reason to want to connect Obama with al-Mansour’s funding program. Gilbert noted the 1979 article also sheds light on the claim that veteran New York power broker and well-known attorney Percy Sutton intervened at the request of al-Mansour to write a letter of recommendation to get Obama into Harvard Law School. “All it would have taken was for Vernon Jarrett to introduce Obama, the son of Frank Marshall Davis, to Al-Monsour,” Gilbert continued. As WND reported in 2009, Sutton, then an octogenarian, explained on the New York-produced “Inside City Hall” television show that al-Monsour brought Obama to his attention. Gilbert said al-Monsour might have known he could fund Obama through the Saudi prince, but first Obama had to get accepted into Harvard Law School for the plan to work. Al-Monsour realized Sutton had the necessary connections to make his recommendation credible to the Harvard Law School admittance committee, Gilbert said. Gilbert also noted the 1979 article explains why Obama was so well accepted in the Chicago-based Muslim community, including by pro-Palestinian professor Rashid Khalidi and Syrian-born Democratic fundraiser Tony Rezko, who is now serving a prison sentence for fraud and bribery. Gilbert wondered if financial indebtedness to the Saudis might explain why Obama was so deferential as to bow to the Saudi king upon meeting him for the first time, at the G20 meeting in London in 2009. “What did the Arab funders expect in return from Obama in return for the academic and political funding?” Gilbert asked. WND reported the testimony of Allen Hulton, a U.S. Postal Service carrier who delivered mail to the home of Weather Underground bomber Bill Ayers’ parents in suburban Chicago. Hulton says he was told by Mrs. Ayers that she and her husband helped finance Obama’s education at Harvard Law School. In reference to just one of the many mysteries surrounding the POTUS – “who’s Obama’s daddy?”- rest assured, this question is germane to the ties that bind him to Jarrett. This is because even if one believes that ‘Uncle Frank’ was really a family friend ( or possibly his birth papa ), it is beyond a shadow of a doubt their symbiotic relationship is revealed ( in many ways ) from the Radical-in-Chief’s own childhood narrative. Namely, that “Uncle Frank” was the most influential adult in his life – bar none. That ship has sailed. Thus, extrapolating further, there is also little doubt that the path of Vernon Jarrett became intertwined with the Radical-in-Chief, at some point in his childhood. Naturally, when Valerie joined Vernon’s clan, she too entered the Radical-in-Chief’s personal orbit. Most intrinsically, no one should dare be fooled by the diminutive stature of Valerie Jarrett, presupposing that she is a little bitty thing, hardly likely to cause much harm. Yes, people still ascribe such inanities of physical appearance to a person’s power, or lack thereof. In a nutshell, Valerie Jarrett is as lethal as a poisonous snake, having ‘made her bones’ in the cesspool of Chicago power politics. Her real estate holdings are so vast; her power so out sized; many men, towering over her, are terrified of crossing swords with her – and this was before she became “The One”s’ alter ego! The White House buck starts (and stops) at Jarrett’s communist door. This entry was posted in Uncategorized and tagged '1979 Article Ties Obama's Real Father To Saudi Financier', Valerie Jarrett's communist/ ideological/familial ties to the Radical-in-Chief-why does this matter?Vernon Jarrett & Frank Marshall Davis-brothers-in-arms by Adina Kutnicki. Bookmark the permalink. Adina, Last night The Blaze TV featured part 2 of The Project, a powerful documentary which details the infiltration of the Muslim Brotherhood into all areas of the United States government. There is no doubt that BHO is totally encouraging this in his administration to the detriment and security of the people of the United States of America. Very troubling! Well, it looks like The Blaze is in agreement with my commentaries. I have been alerting the public, to the Islamist-in-Chief’s fealty to the Muslim Mafia, for quite some time. I defy anyone to challenge my assertions. My facts are rock solid, troubling as they are. The CPUSA connections got him into Harvard and the Saudis paid his way. It makes sense. It fits. Indeed. It fits like a glove, and the trail is perfectly clear. The contents are not suppositions, they are the linkage to his sources/helpers. I had great suspicions four years ago about the source of much of the funds for his election. My suspicions have only grown this time around. Throughout history grateful recipients of funds have tended to bow deeply to their benefactors. I am surprised nobody has begun to investigate this. I am sure that eventually we will learn the truth about his place of birth, his source of funds and many other things. I read “The Communist”, which has a lot of similar details. He was unable to track down anything specific but it seems very suggestive that Frank Davis came from Chicago, with tons of connections in Chicago, and by “coincidence” Obama wound up there. I think he was “sent”, as they say, by Davis and his friends, with pre-stacked connections he was able to use to get ahead. Also, if the Saudis paid for his education, he may well be paying them back by discouraging development of local energy resources. Much better, from his point of view, that we continue with our insane clean energy experiments and continue buying oil from his cronies. The Keystone XL pipeline is a matter of great importance to the Saudis, I am sure, and the good American jobs it would create are a matter of prime indifference to him.